I have wanted to paint a Flesh Tearers unit forever. When this project came along, there was no way I could pass it up. It's a simple 5 man squad along with a Librarian. 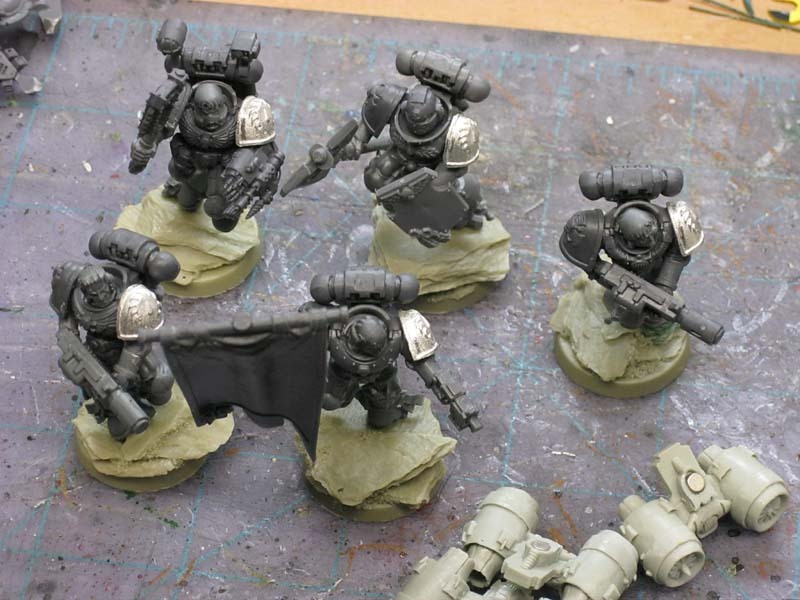 They'll have the option of sporting the regular power packs or Heresy era jump packs from Chapterhouse Studios. To magentise them, I used a 1/8 inch drill bit and drilled out both the regular backpack and the jump pack openings. I had to be real careful with the regular packs since they are so shallow and I did not want to punch through to the other side. The torsos had the little nub cut off and a hole was drilled in its place. 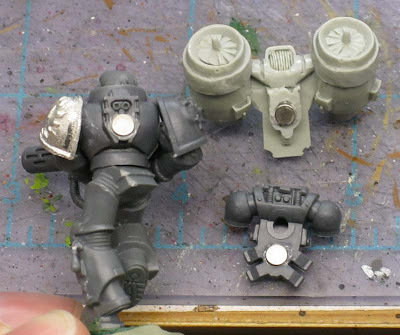 The magnets are 1/8 inch as well and are held in place with a drop of superglue. Each time I would add a magnet, I would test the polarity a hundred times to make sure I had it right. They all had to match up so that I didn't have to worry about certain packs having to go on certain models. Aside from the Librarian conversion which will be covered in the next post, I added a small icon to the top of the banner that one guy is carrying. I figured it would help reinforce the Chapter theme a bit more than the standard topper. It's made from two layers of plasticard... one for the saw shape and the smaller one for the blood drop shape with a tiny bit of greenstuff added to the top of that. All of that was added to a Blood Angels icon that had the front of it cut away until it was flat enough to support the new pieces. I'm working on getting one of the guys painted as a "test" to see how the GW color scheme works out. I'm copying the technique from one of the recent issues of White Dwarf. Naturally I'll be posting my results to show you all how that comes out once I get him painted up. Not a fan of the metal shoulder pads myself. You'd be far better off making your own chapter icons from green stuff in my opinion. Having said that, they do look pretty sweet. Looking forward to the Librarian. The ones i regularly use are 2mm wide and 1mm deep and are strong enough for most works. Is there a reason you used such large ones ? Dugatron: Those are what my Client provided. 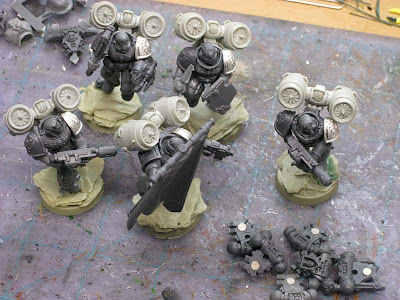 I think they work well enough and it helps keep costs low as opposed to trying create and cast enough for the squad. Ed: Yikes, I got that wrong, they are 1/8 inch magnets. Correction made in the post. Thanks for bringing it to light. Lokjaw: I never thought about marking them with a black marker. I might try that next time. I'd like to point out that you should be sure to use the 1/8" magnets and nothing smaller. I used smaller ones and every time I touched the model the jump pack fell off. The jump packs need the extra hold since they're so heavy. Smaller magnets work great for arms though. My Sarge is magnetized to switch between all his weapons available. The slightly larger size magnets increase the surface area of the magnet itself and that's what helps with contact and keeping the bits together I've found. Got too small and the surface area of the magnet reduces to the point where even the smallest, lightest bit will break away too easily. are those the shoulder pads from CHS as well? Wyatt: They are the standard metal GW ones I believe. I'm not sure where you'd get them now unless they could be ordered directly from GW.